The Marte Coastal Defence System developed by MBDA was unveiled at DIMDEX 2014 exhibition. Image courtesy of MBDA. The MCDS has two missile options, Marte MK2/N and Marte ER. Image courtesy of MBDA. The MCDS launcher module consists of four firing units. Image courtesy of MBDA. The new Marte Coastal Defence System (MCDS) is designed and built by MBDA to meet the needs of naval forces in modern combat missions. It was unveiled at the DIMDEX exhibition in Doha, Qatar, in March 2014. The coastal defence system is intended to perform surveillance of maritime coastal traffic, monitoring and picturing sea lines of communication, and identification and detection of hostile targets. It is also capable of countering and interdicting the potential coastal threats in territorial waters. The MCDS can be equipped with a new generation of Marte anti-ship missiles for the destruction and neutralisation of suspicious vessels in littoral and blue waters. It can be deployed in standalone mode or can be operated as part of an existing surveillance radar network. The Marte coastal defence system is based on the Marte anti-ship missile family, which includes Marte MK2/N, Marte MK2/S and Marte Extended Range (ER). "The MCDS can be equipped with a new generation of Marte anti-ship missiles for the destruction and neutralisation of suspicious vessels in littoral and blue waters." The MCDS is composed of a command and control (C2) module, a launcher module and a logistics module. It has two missile options, which include ship-launched Marte MK2/N and helicopter-launched Marte ER. It is equipped with active surveillance equipment for monitoring of enemy vessels, and a data-link for receiving the target data. The launcher module consists of four firing units, which can be mounted on ISO standard trucks and deploy up to four missiles each. The logistics module features a logistic and support vehicle, as well as a range of reloading vehicles. The Marte defence system can be configured with different and flexible designs based on the customer’s requirements. The Marte MK2 anti-ship weapon, developed by MBDA, is capable of operating at high, supersonic speeds in all weather conditions. It has fire-and-forget and sea skimming capabilities. It measures 3.85m in length and 0.316m in diameter, and has a maximum weight of 310kg. It is equipped with semi-piercing high-explosive warhead, impact and proximity fuses. It is a derivative of the Marte MK2/S helicopter-launched missile and was launched in October 2006. It is designed to be equipped with a warship or a coastal battery for the control of brown waters in complex littoral operations. It has a range of more than 30km and can destroy fast-moving targets. The MK VI patrol boats are designed and built to serve as the next-generation patrol boats for the US Navy. The Marte ER anti-ship missile is the latest variant in the Marte missile family. It is intended to engage targets over a wide area of the sea. 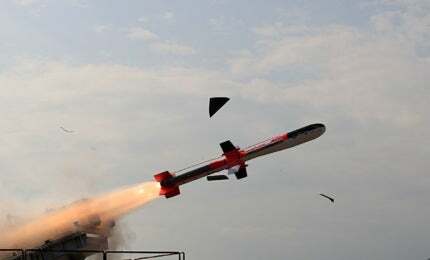 It is interoperable with the Marte Mk2/S missile. It was integrated on to the NH90 NFH maritime helicopter during the 2014 Farnborough International Airshow . The Marte ER missile is powered by turbojet propulsion system. It can be flown with increased speed at an extended range of more than 100km. It also features the new ISO-calibre cylinder cell. The Marte anti-ship missile is guided with mid-course inertial navigation through waypoints, and active radar homing terminal. The C2 module is housed in an ISO-standard, 12ft command and control shelter, which is connected with the upper-level surveillance system through a data-link. There are consoles in the C2 module to control and manage radar information when the missile system operates in stand-alone mode. The consoles are also used to track targets detected by the surveillance system in integrated mode of operation.